Jaipur : A major controversy broke-out at Jawahar Kala Kendra (JKK) in Jaipur Art Summit today here, when people saw a 'cow' hanging at the venue. This was a dummy cow as a mid-air art installation to convey the message of saving the animal from eating plastic waste at a summit here. 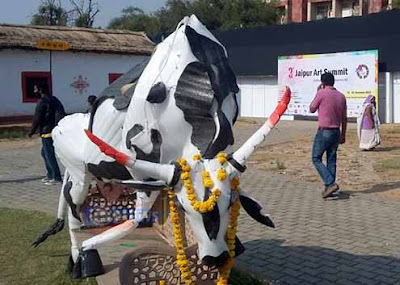 The dummy cow created a controversy today with activists raising objection to it and forcing the organisers to pull it down. According to report, the dummy made of plastic and hooked to a balloon was installed in the open area of the JKK, a centre of cultural and artistic activities, and was floating around 200 feet height which caught attention of activists who objected and called the police. 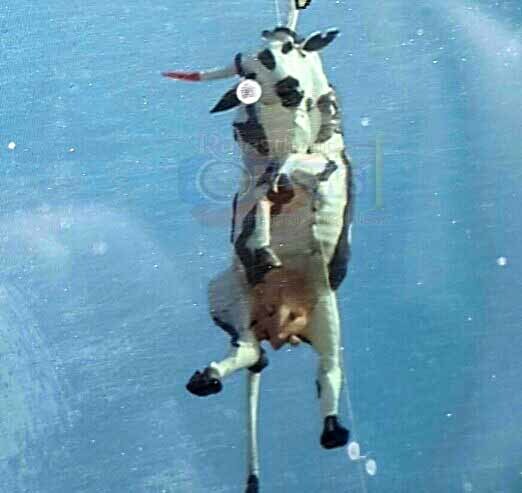 Acting on the complaint filed by some members of a particular community, the Jaipur police reached the spot and asked the organisers to bring the dummy of cow down. Also, two persons have been arrested in this regard. After the police picked up two persons for interrogation from the place, the organisers removed the dummy to pacify the things. According to organisers, they wanted to send a message of saving cows from plastic waste. "We didn't want to hurt anybody's sentiments", said organisers. Bajaj Nagar police station SHO, Mahendra Gupta told that, "Two persons were taken to police station for questioning and were later released in connection with the matter. Activists raised objection and demanded action against the artist and organisers but no FIR was lodged,"
"Message of the art work was clear that we should protect cows from plastic waste but some people objected and called police and two of our artists who argued with police were picked up," the event's organiser Vidhya Prakash said. After the issue, we removed that installation which was made by a local artist Siddharth Karwal. It was the opening day of the five-day art summit, he said. "Cow is highly respected and the way they presented their art cannot be tolerated therefore we brought the matter to the notice of police," Suraj Soni, the activist who raised objection, said.